Greetings from Iraq! Thank you for your most recent shipment of cards for Mother's Day! People are already picking some out to send home. We enjoy so much seeing all the creative cards you and your helpers make for us - lots of smiles here - and I am sure at home when the cards are received!! We are down to our last 2 months here, hard to believe. You are in my prayers - thank you for yours! Thank you so much to you and all of the volunteers at Operation Write Home! I and my fellow soldiers all love the cards made with so much love that we can then use to return love home. 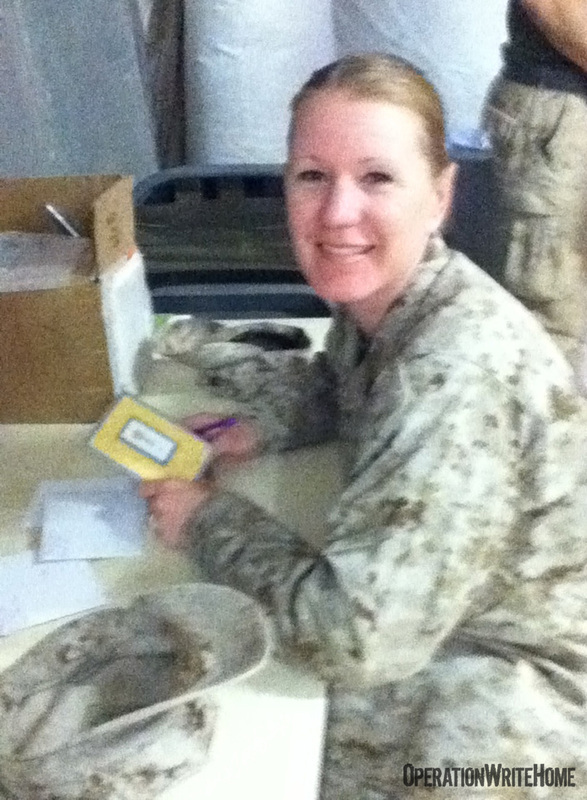 I use them to write to my three boys (17, 8, and 6), husband, parents, and sisters while I am here at ISAF HQ in Kabul, Afghanistan. It is thoughtful Americans like you who keep me smiling. PS Thank you for the pic of your awesome companion. It will be perfect hanging on my wall at the Afghanistan Supreme Court where I work. Ciara will represent the good ole USA well when Afghans visit my office! Could we get another box of cards shipped to us? We really appreciate the hard work and long hours your committee volunteers to keep this program running. Everyone in the Hospital is pleased with Operation Write Home. Thanks again! Thank you for the cards, they were a big hit! The soldiers here are very excited and have already started writing home. It is a great thing that you all do for us and we appreciate it very much. Thank you again! I just wanted to say thank you for donating these wonderful cards. One of my Marines got a box in the mail and they are just AMAZING!! 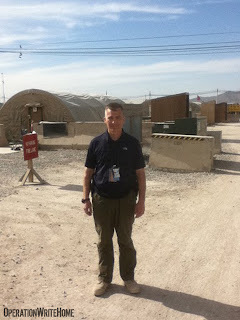 I was personally very happy because I am deployed and will miss my 3 kids birthdays. 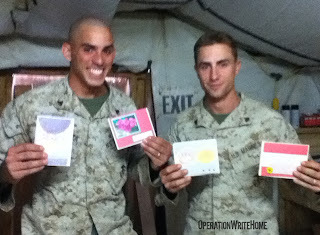 We don't have a good PX out here to buy cards so the "Operation Write Home" cards were just perfect. I truly appreciate what you are doing for deployed service members. 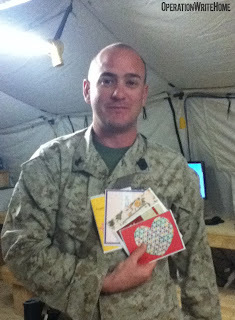 I know all the Marines here at Camp Dwyer, Afghanistan are sending these cards to their family and friends. 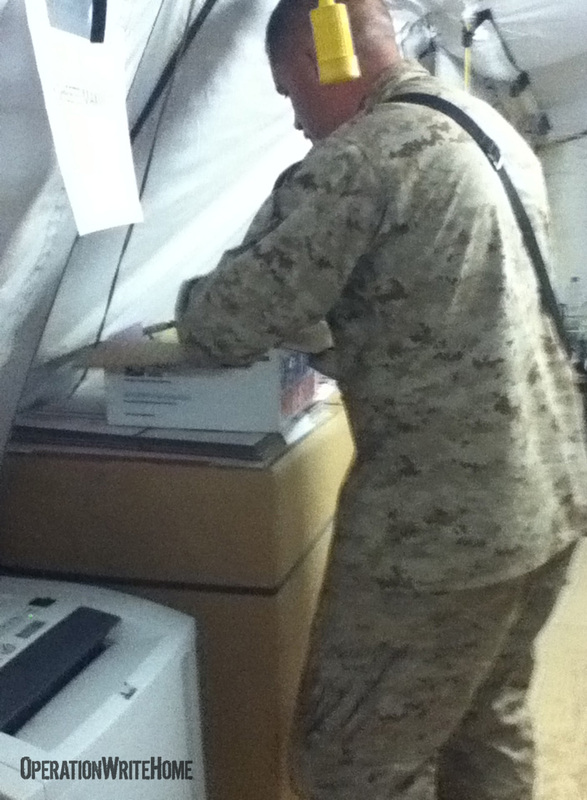 I've been in the Marines almost 16 years and I am just amazed at the things people do to support the troops. Thanks again! I just want to send a big thank you to you all for the wonderful service you are providing. The time, talent, and resources are unbelievably impressive. I received two cards in the mail yesterday (one for me, another for our 9 month old daughter) from my husband, a Marine serving in Afghanistan. I was so incredibly surprised to receive such beautifully handmade cards! Of course, I sat there bawling my eyes out about what he wrote in each of them but after the tears dried, I was able to appreciate the beauty of the cards and how they must have inspired him. You see, my husband isn't one to usually send cards. He very rarely has in the past and he dislikes the store bought cards that have really long preprinted sentiments. He has always felt they were somehow "fake" and would rather speak from the heart. Your cards gave him the opportunity to do so. One was blank inside and the other had a very short sentiment. They were perfect. I think he also liked the fact that they were handmade, obviously with love and great attention to detail. Even though our daughter is not old enough to read or understand what Daddy wrote, I will certainly be keeping the cards for the future so someday she will know just how much her Daddy missed her. He did mention in his card to me about how "they have these awesome free cards" and how "kids just don't know what it's like to deploy these days" because of little perks like these that so many nice people provide. ;) (He has a few other deployments under his belt, including twice to Iraq.) I'm a cardmaker/scrapbooker myself so I truly do appreciate the time and material it takes to produce them. I didn't realize your organization even existed but I'm so incredibly grateful that you do. It means the world. I somehow also felt a personal connection since my husband and I are both from the Seattle area and were happy to learn your headquarters are right down the road. Even though we're stationed at the Pentagon, I've moved back home to Western Washington to be with family for the year while he's gone. I hope to be able to make a few cards myself to give back. Please thank Sue A for me as she made one of the cards my husband sent (it had a stamp of two bunnies hugging with "miss you"). The other card was not marked but was just as beautiful with a jeweled butterfly. 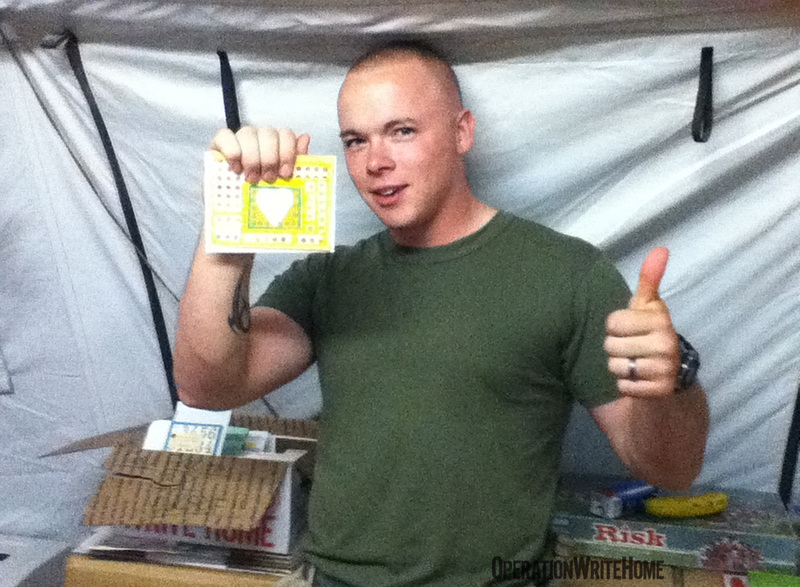 Again, many thanks for your support to our troops and keep sending them! I am continually amazed by the support that we receive from our fellow citizens and impressed with your vision and organization to get all of these cards collected and sent over here. Thanks again and please reiterate to your team how much we love these cards! I wanted to express my gratitude for your prayers for me and all of us who are here. Your card helps to remind me of the support we have behind us. Also, it's nice to know there is individuals who appreciate all of us who serve so we can have the freedom we live with. Thanks for sending the other cards. We were also lucky enough that a soldier brought in about half a box of cards from your same organization and there were about 50 Mother's Day cards so we will be able to help some of the guys. I just cant believe how many write letters home. It is just so heart warming! Thank you for helping make this program such a success! Thanks so much for sending cards to Afghanistan. I was able to pick out wonderful handmade cards, so I could send my children and my wife each a card from "downrange". We normally live in Germany, but at one time I was stationed at Fort Lewis, WA and we lived in Auburn, Washington. So, it's kind of like the cards were sent from home. Just so you know what it looks like here, and who received the cards, here is a fun picture. Thank you very much for your wonderful collection of cards. The personal touches and craftsmanship is outstanding! 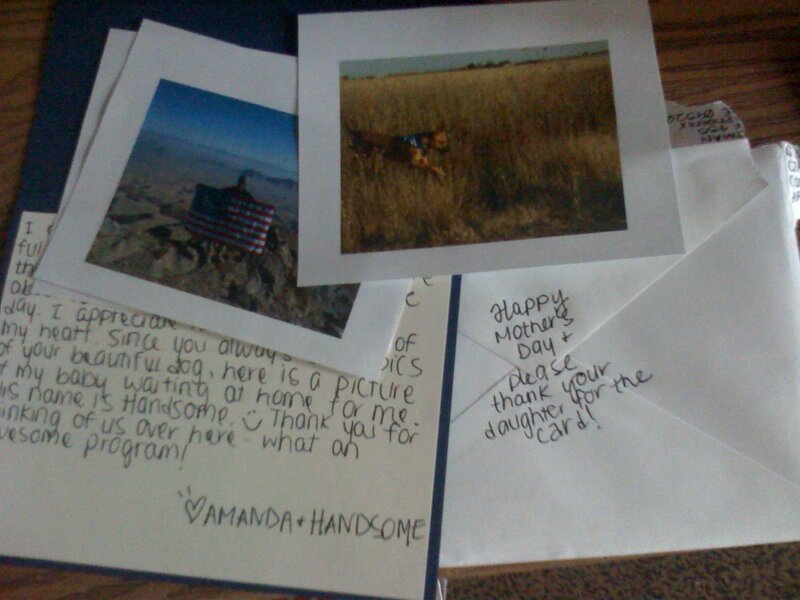 My wife and daughters absolutely love receiving the cards which brings a very personal touch versus an e-mail. Like many other posts, the cards do not last long, as they are a fan favorite. I especially like the fact that you enclosed Mother’s Day cards, as many men would certainly forget this important day. Thus, thank you for keeping us out of the dog house. We received your cards and I put the box out for everyone to go through. The cards lasted a couple days! They are a big hit with everyone and we appreciate you and your volunteers so much! I must let you know that I think Operation Write Home is one of the greatest programs! It makes it so easy to write home, especially with the free postage! Hello Sandy, I am just writing to let you know we have received the box of letters and Mother's Day cards. Thank you so much! Also, please extend our thanks to Ciara as well. Tell her I'll take her for a run when I get home. Blessings. CH (CPT) C. E. L.
As my tour begins to wind down, I wanted to say thank you to those who have done so much to make my life more enjoyable by providing creature comforts. The cards have meant a lot to me as well as the people that I send them too and the Service Members and Civilians that I share them with. By the way, you guys are doing one of the greatest support tasks in the world! Guys come into the chapel all the time looking for cards to send for various occasions. And when they don't come, I take them to the dining facility (DFAC) and hand them out at dinner a month before a big holiday and get them all to fill them out. At first they are skeptical and tried to play it off as too mamby pamby for themselves, but soon they all get into the act and they are running around trying to see what each other are writing and signing each others cards to family and friends. Thanks for the joy you bring to us all: here and back home! Thank you for sending me the box full of cards through Operation Write Home! When I received the box yesterday, it sure made my day. It was also the day I sent out the last of the cards I picked out for my kids. I'm letting all my friends know about the box I got so they too can enjoy the wonderful handmade cards. I'm sorry you've been off work because of surgery. I know how that can be - a few years back my husband also had surgery on his foot, and was on bed rest for a couple of months, then another month with a boot and crutches. I bet you can't wait to walk freely again! By the way, thanks for the photo of Ciara. It made me think of my dog Makai who is no longer with us. He was a chocolate lab who I miss very much. Well I got to get ready for work, I'll talk to you again soon! I just wanted to express my gratitude for this project and what it means for our soldiers fighting overseas, and how much it means for us at home. My husband is currently serving in Afghanistan, and this week my children and I received two beautifully crafted cards from him that had Operation Write Home stamped on the back. Thank you for serving our troops this way - in a time where the days and weeks are long while we are apart, not only is it wonderful for them to be able to send us something unique and created with love, but for us at home, hearing from our loved one is a treasure, but when it is something handmade, even more so. First, I want to personally thank you for all you do for the soldiers here and elsewhere. Your box of cards is greatly appreciated and the personal letters have made our wall brighter. I suspect we will not need another box but will let you know if the situation changes. Again, thanks for taking the time to let everyone here know that people do remember. Thank you so much for the beautiful handmade cards. I can tell how much time and effort were spent to create these. I appreciate your support and warm sentiments. Thank you for your generosity. My husband is currently deployed to the Middle East and is using these cards to keep in contact with our children. You should see how their faces light up everytime they get one of these cards from their Daddy. My three year old carried her card around with her all day long and then curled up with it at night to sleep. These cards really do make a difference! THANK you so much for what you're doing! You have been a tremendous blessing to our family!